A student of mine once commented that “Happy Birthday” was the most useful chord melody arrangement that she had ever learned. So many opportunities to use it! But, first I have a little news. My new book, The Chord Melody Book for Ukulele, was officially released on June 1. If you would like to pick up a copy please click the link below. As a BONUS, every hard copy ordered comes with a complimentary download version! You can also purchase a copy of the download version on its own. Here is the link! OKAY! Now for the lesson. Have you ever strummed the chords to a song without singing the words? If you’ve never tried it give is a go. Strum the chords to a song but don’t sing the words. Better yet, strum the chords to a song and ask a friend to “name that tune.” I’ll bet they won’t be able to tell you which song you are strumming. When we sing a song we provide the MELODY. The chords provide the HARMONY. There are very few songs which have chords that are distinct enough to be recognized without the melody. The melody is BY FAR the most recognizable part of a song. So, if you are strumming the chords to a song, you’d better sing the melody too, or nobody will know what song you are playing. But, what if you don’t want to sing? Or, what if you would just prefer to do the song instrumentally? How can you play the song with just the uke? Picking the melody is one idea. If you pick the melody from today’s song, “Happy Birthday,” people will instantly recognize it. The problem is that the melody picked on its own, without chords or accompaniment, sounds, while charming, a little bare. A little lonely. So, we have a problem to solve. How do we play chords and melody at the same time on the uke? How do we play CHORD MELODY? Today, I’d like to talk a little about “up the neck” chords and their importance in playing chord melody arrangements. The first chords that we learn are chords like C, F and G7. We begin by learning the “open” versions of these chords, which are easiest to play because they usually include one or more open strings. “Open” chords can also be played in other locations on the neck where they are often referred to as “inversions” or “voicings.” I refer to these as “up the neck” versions of the chord. Arranging a chord melody often requires use of these “up the neck” chords, as it is sometimes the only way that we can play the chord and melody simultaneously. If you are interested in chord melody playing these new chord shapes will likely become your new hobby! Be CAREFUL! 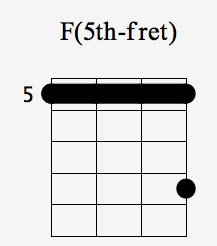 The F(5th-fret) chord diagram (above) is not like a regular chord diagram. Do you notice the little number five to the top left of the diagram? The number is telling us that the first fret on the diagram is the 5th-fret of the ukulele! In other words, this chord is made by barring the fifth fret with your index finger, while the pinky frets the note on the 8th fret. So, watch out for those little numbers to the top left of diagrams. You will see them often in the world of up-the-neck chords and the chords won’t sound right if you don’t play them in the right place on the neck! I hoped you enjoyed this lesson today. If it has ignited an interest in solo ukulele playing, please consider picking up a copy of The Chord Melody Book for Ukulele. 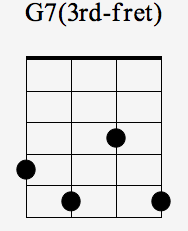 ← UD#59 Chord Melody: What Are You Doing New Year’s Eve?